WordPress is a one free and open-source, highly customizable and favorite content management system (CMS) that used by bloggers and webmasters. Nothing is secure, even CMS “always” has bugs, then patched and updated, but then the following bugs is coming, etc. There are also many potential security vulnerabilities in WordPress. In this article, I will show you how to use WPSeku, a WordPress vulnerability scanner in Kali Linux, that can be used to find security issues, bugs, or other potential-hijacked information in our WordPress installation and block potential threats. You may familiar with WPScan if doing WordPress vulnerability scanning. 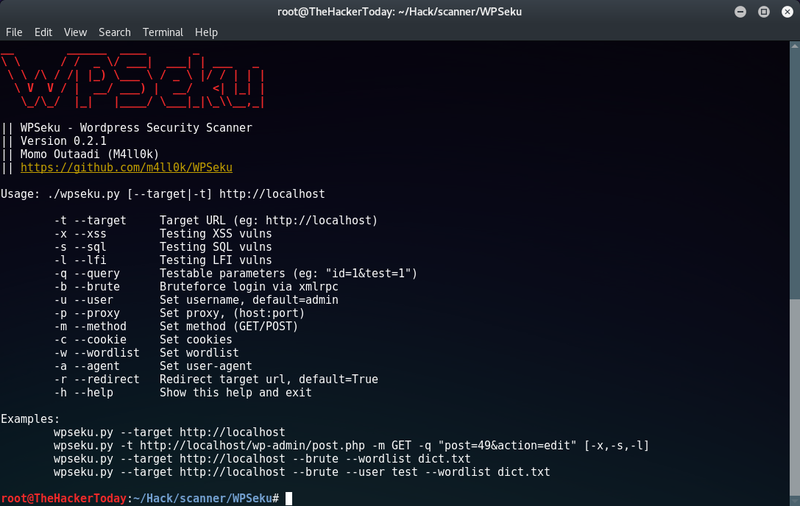 WPSeku, in other side is almost does the same, it is simple WordPress vulnerability scanner written using Python, WPSeku can be used to scan local and remote WordPress installations to find security issues. Before running WPSeku you need to make sure that the target using WordPress. Yeah of course! Check using whatweb for detect what CMS does the target used. These are the output we got!